What Defines a Team Player? 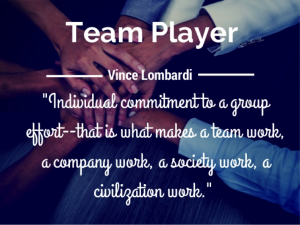 Home / Blog / What Defines a Team Player? 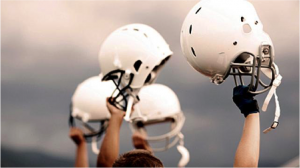 With football season kicking off, we are constantly being reminded of the importance of being a team player as we tune in to watch the big game each Monday night. Whether it is out on the field, in the office or even in the classroom, being an effective team player is essential to any group’s overall success. Every team needs a strong set of players in order to perform well. But what defines such people? Sports teams are the perfect examples of how players working together can achieve so much more than one player acting alone. For example, you may not be the best at scoring, but you’re great at moving the ball down the court. You know that if you pass the ball off to the person who is a good scorer, the team has a better chance of winning. Everyone on a sports team plays a different role, according to their strengths, but this idea also stands true in the workplace. In a business context, what does the term ‘good team player’ truly mean? What do leaders want from their team members and how can you make more of a significant contribution to your team? In the world of psychology, there is a corporate diagram known as the Belbin model, which states how people naturally tend to assume ‘team roles’ within the workplace. Here is a more in-depth look into this model as well as helpful tips on how to make a bigger contribution to your team in the future. Only you know what you do best. Maybe you’re incredibly organized, you’re a great public speaker, or maybe you are good at researching that hard-to-find information. Whatever your strength may be, you have something valuable to offer. 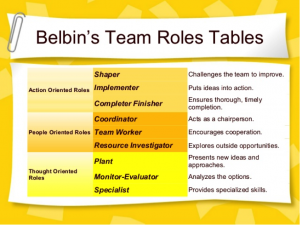 Use the Belbin Model to find a role for yourself within your team that allows you to do what you do well. This will not only help you make a meaningful contribution, but it will increase your chances of doing a job well. It’s much easier and more satisfying to do tasks when you are naturally good at them. Teams usually come together to handle an issue that is difficult, if not impossible for a single person to do on their own, and when a group knows their strengths and works well together, creativity levels are generally higher, as people tap into the strengths of one another. be a valuable asset to your team is to deliver what you said you would do and deliver it on time. For some, it seems all too easy, and unfortunately quite common, to make promises they can’t keep. If you commit to completing a task by the end of the day, make sure you follow through and do so. If you say you will attend the meeting at 5:30, do not be late! Being reliable can also apply to the work you do for the rest of the group. If you hold yourself to high standards, people will depend on you to produce quality work. However, if your output is excellent one day but only mediocre the next, the team may then regard you as being unreliable. So make sure to always hold yourself to the highest standards and follow through with the tasks you commit yourself to. If you have ever worked with a team, you are familiar with the notion that things can change – and fast! People may join or leave the group without notice, budgets may fluctuate, or goals may be redefined. The best and most effective team players know how to be flexible. Don’t fight the change – instead, view it as a new opportunity for growth. What you may find is that the group members you have, the approaches you use and the goals you originally started with have all changed by the time you’ve finished. However, by staying flexible you can take advantage of the new opportunities that arise and you will be able to help others do the same. Your willingness to remain comfortable and positive in an ever-changing environment is an important business skill to have – and your boss will likely take notice. Being a ‘good team player’ is not always easy. Teams are usually faced with solving difficult problems and they often have to work under tight deadlines and strict budgets. But this can be your chance to shine. Start looking at teamwork as not only a challenge but a great opportunity for self-improvement. Help your team by using your strengths, clearly understanding your role, staying flexible and reliable and always emphasizing strong communication. By being cooperative and having the willingness to work, you will make a good impression on everyone…including your boss.